722 Colonel Ledyard Hwy, Ledyard, CT 06339. Route 117 at Col. Ledyard Hwy; enter parking from either road. Worship is Sundays 9:30 – 10:30 am. Sunday School begins halfway through worship (ages 3 – 8th grade). Your children are welcome in worship, Sunday School and the Toy Room, whatever you like. There is a changing table in one of the restrooms. The Pastor is Rev. Dr. Catriona Lanza, revgrant.LCC@snet.net. 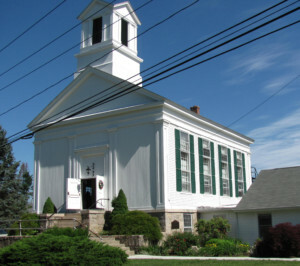 The Church Office is open Monday-Thursday 8am-noon, ledyard.cong.church@snet.net, 860.464.9926 (Melanie Brule, Office Administrative Assistant). The Music Director is Marty Wirt and the Bell Choir Director is Deb Betz. The church is handicapped accessible. For more information: What to expect in worship, Baptism, Outdoor worship, Accessibility, Photo gallery, Testimonials. Beginning Wednesday, March 6, 2019, the Ledyard Food will have hours from 9-11 am. We felt called to act on Jesus’ commandment to care for his people by taking on the responsibility of hosting the Ledyard Food Pantry. We totally renovated our outbuilding by the Route 117 parking lot to create a pleasant, welcoming space. We increased the hours it is open, including evening and weekend hours, and we increased the types of products it provides. You are welcome to join us in this good mission, whoever you are! Questions? Call 860.464.0314 or email ledyardfoodpantry@gmail.com. On Facebook too!